Do you want to support a friend or loved-one as she travels through life and face its challenges? Why not give her this unique and meaningful bracelet? The oft-touted calming qualities of Sodalite (said to help with life's stresses and strains), combine with the symbolic St James Cross (Cruz de Santiago of Spain), to make this a truly inspirational piece of jewellery. And Pearl has been a popular gem from ancient times as a symbol of peace and purity - lifting people's spirits and making them feel calm and dignified. The 1,000-year-old Way of St. James (El Camino de Santiago - in Spanish), criss-crosses Western Europe, arriving at Santiago de Compostela in Northern Spain on the Atlantic coast. Some 200,000 people travel to the city each year from all over the world: Some people walk, others travel by bike. Many travellers choose to do the Camino for personal, rather than any spiritual or religious reasons - taking time out from their busy, modern lives and perhaps finding inspiration along the way, whilst reflecting on their lives in a supportive environment. Many carry with them a St James cross as featured on this bracelet, which is a symbol of protection and faith. But, whatever somebody’s journey - whether on El Camino itself, on holiday, a business trip, a gap year, trekking, and so on, you can pass on your special wishes for peace and safekeeping with this unique bracelet. Dimensions: This beautiful and eyecatching bracelet is made of dark, smokey-blue Sodalite gemstone crosses, plus white pearls and metal beads, with a small, sterling-silver St James cross charm. It is approx 7.5ins long. Do you know someone who could do with a more calm and confident approach to life's current challenges? 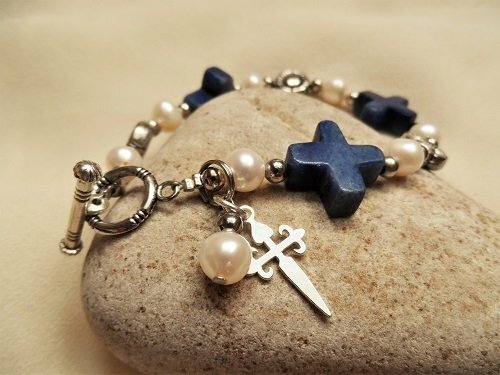 Give them your support with this beautiful sodalite and pearl St James cross bracelet - a unique piece of meaningful jewelry and a wonderful gift for life's Camino. Comes gift-wrapped, like all our presents - and we can print a personal message on your behalf. More information about the symbols of Spain's Camino de Santiago - The Way of St James . SODALITE : This so-called “Peace gemstone" is said to be the peace and negotiation gemstone - and a gem for endurance. Sodalite jewellery is characterised by its dark, intense blue colour - sometimes with white or yellow streaks. Some say the gemstone can help change the way you feel about yourself and it is believed to have subtle, soothing energies and help people see the wisdom of adopting a simpler, calmer and less hectic lifestyle. Read more about Sodalite jewellery .